This Ferrari 250 GTO is the most expensive ever auctioned car : RM Sotheby’s has the former car of Phil Hill at 24./25.08. Auctioned in Montereyin 2018 as part of the Concours d’Elegance at Pebble Beach , California . The hammer fell at $ 48.4 million. The racing GTO with the chassis number 3413GT comes from the collection of Gregory Whitten , the former chief developer of Microsoft . He had bought the car 18 years ago – for 7 million dollars. The difference to the now achieved auction result corresponds to a yield of a good 38 percent – per year. 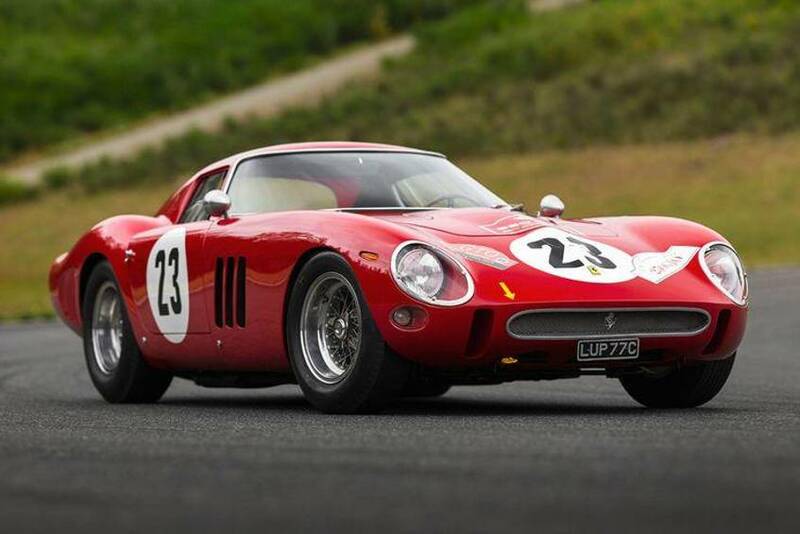 The 250 GTO was the highlight at the RM Sotheby’s auction on August 24th and 25th in Monterey . In the context of the Concours d’Elegance in the upmarket Golf Club of Pebble Beach and the historic races on the race track of Laguna Seca all well-known auction houses offer a spectacular offer. For the Auctioneer Elite, this is the most important weekend of the year. Even before, RM Sotheby’s had taken the pole position in the race for the greatest prestige: the Ferrari GTO had already been honored two months earlier as the most expensive car ever to win an auctionwas offered. At the end he was with a revenue of the equivalent of 41.6 million euros, the actually most expensive classic car, which has been auctioned so far. The record for the highest premium in a vintage car was so far at 38.115 million US dollars. The British auction house Bonhams presented her in 2014 also in California , also with a Ferrari 250 GTO. He was previously owned by Fabrizio Violati for nearly 50 years and was part of his Maranello Rosso Collection. The 250 GTO has a value for vintage collectors such as paintings by Leonardo da Vinci , Pablo Picasso or Vincent von Gogh for art lovers. Only in April changed a copy (chassis 4153GT) for $ 70 million in the private market owner. This 1962 to Belgium delivered Ferrari 250 GTO with very good racing history belonged for a long time to the collection of the Gläsel family. Like all of the 39 hand-crafted Ferrari 250 GTOs from 1962 to 1964 , the one offered by RM Sotheby’s also has a unique history. It is the third ever built GTO and was used as a test car for the Targa Florio 1962 before selling Formula 1 World Champion and Le Mans winner Phil Hill . Then he was taken over by the 31-year-old gentleman driver Edoardo Lualdi-Garbardi, scion of a wealthy textile manufacturer’s family from Busto Arsizio near Varese. The Ferrari private driver won with the approximately 300 hp GTO immediately the Italian mountain championship. In May 1963 he sold the Ferrari to the Roman Gianni Bulgariwho won the 3-liter GT class at the Targa Florio together with his team mate Maurizio Grana. As fourth overall, they were the best-placed private riders in the road race in Sicily. At the end of the year, Corrado Ferlaino from Naples bought the successful Ferrari . From factory Scossier Scaglietti he had the body to the current state of 1964 retrofit. A total of four 250 GTO were converted to this windschlüpfigere body, the three 1964 built Ferrari delivered directly from it. Ferlaino used his GT with the 64er body for the first time in the Targa Florio and won the overall fifth again the big GT class together Luigi Taramazzo. After that, the Ferrari was sold with the chassis number 3413GT to England to Dan Margulies. Other owners were Neil Corner and construction machinery mogul Anthony Bamford. After an interlude in a Japanese collection, the GTO returned to England and decorated the collection of L’Oreal boss and racing driver Lindsay Owen-Jones. In January 2000, Gregory Whitten bought this GTO, which he sells after over 18 years. It was a good deal for the IT specialist: he paid $ 7 million for the Ferrari back then . Thanks to the record amount, he has earned 2.3 million a year in the car .